Good News, More Colors Avaliable We Can Do Any Size! Wecome to My Company!!!!! 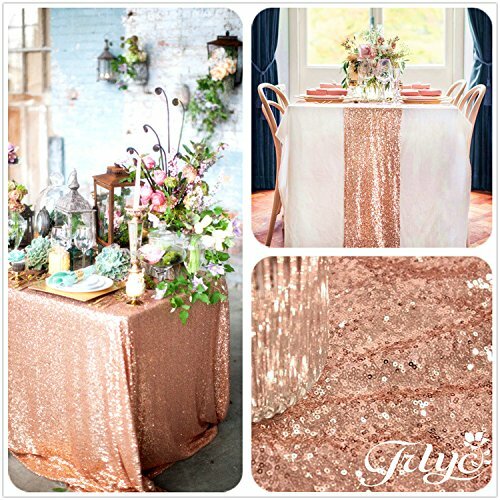 Scrumptious~Romantic~Sparkly~ Rose Gold Sequin Tablecloth is here! It will be the perfect addition to display your cake or make a statement with your head tables dressed in this trendy absolutely gorgeous linen. This is the perfect Tablecloth to add that something special to your best day ever! It’s also a beautiful keepsake that you will treasure for years while entertaining for the holidays or a dinner party! If you want to purchase more of our products, please search Amazon for TRLYC to see our Storefront and all we have to offer. Thank you!